Polylok’s new orfice diffuser offers advancements in effluent distribution you will not see in other pressure dosing systems. Our patented design includes an impeller that directs wastewater from the discharge piping in a 360 manner. This optimizes the leaching fields and protects the soils around the piping from unnecessary erosion. 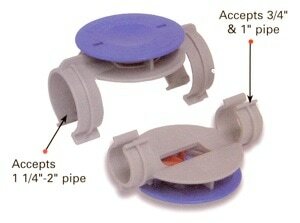 Our diffuser accommodates two sizes: 3/4”-1” pipe and 1-1/4”-2” pipe.